A senior Cameroon government official has said Cameroon is a ticking time bomb. The official, who has elected anonymity, holds that with the chaos taking place in the country, it is clear that if things are not properly managed, the country might derail into a full-blown chaos. 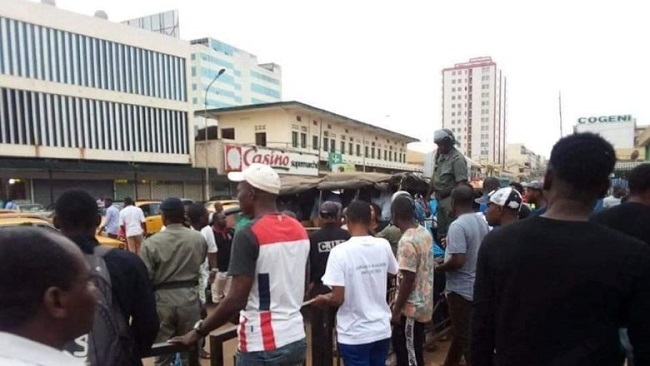 The senior official who spoke to the Cameroon Concord News Group Chairman over the phone was referring to the running battles between hawkers and policemen in Yaounde on Friday, February 8, 2019, which resulted from a bad decision by a police officer who molested a hawker in the Yaounde Central Market, the country’s largest market. The other hawkers quickly jumped into the fray to support their colleague and this developed into a huge stand-off between the hawkers and government security forces. “Cameroon is a ticking time bomb and if care is not taken, it might go off and the consequences might be far-reaching. This country is gradually drifting into chaos. There are demonstrations every day in the country and the government appears to be unable to put a handle on the issues. We are all living in fear. Even senior government officials are wary of the path the country is taking. We hope things could be brought under control to spare the country the type of chaos we see in other countries,” he said. “The Anglophone crisis seems to have opened the floodgates for demonstrations and chaos. Even Francophones are now courageous to challenge their own authorities. Anglophones might have lost so many lives, but their determination and selflessness has taught Francophones that they must stand up for themselves. The government has to be very careful the way it handles some of these issues. The country is a tinder box and any little thing can trigger a huge fire,” he stressed. “Things have gotten worse since the last presidential election whose results Professor Maurice Kamto is protesting. His determination to reclaim his victory is causing some government officials to lose sleep. Many of them have already sent their children out of the country. They are scared of any reprisals in the event of a regime change. They know they have not handled things properly and the use of brute force has not helped matters, especially in the North West and South West regions. We are all living in fear. If I were still young, I would have migrated to another country just to escape the disaster that is hanging over our country like the Sword of Damocles,” he said. “President Biya is out of steam. Those around him are manipulating him. They are mostly people related to his wife and they are simply implementing Chantal Biya’s agenda. Our country is in for real trouble and the days ahead are not promising. We need divine intervention. Our country is bleeding. The country is losing its young human resources in a war that was declared out of arrogance. Besides, the war itself is consuming lots of resources. The Anglophone regions have been contributing much to the country’s GDP, but with the fighting getting more violent by the day, the country is being robbed of those resources that could help make life better for all Cameroonians. The lock-down is already biting the government and I hear there will be a more rigorous lock-down after February 14. This will trigger more problems and many more souls will be lost,” he regretted. The economic chaos resulting from the war has hit the country like a ton of bricks and it will take Cameroon a long time to recover from the mess it has created for itself. The country is cash-strapped and some of its allies have bad news for the government. The Anglophone problem has now become a millstone around the government’s neck. The people are sick and tired of a government that has nothing to show for its long stay in power. Its ailing and senile leaders hold that only violence can address all the issues facing the country. They are mistaken. Times have changed and approaches must also change if peace has to prevail. The failure to embrace new ways is ruining many things and enabling nepotism and tribalism to rear their ugly heads. The country is clearly dealing with many crises. The arrest and detention of Professor Maurice Kamto, the clear winner of last year’s presidential election, has opened a new front in the battle to oust the crime syndicate that has been ruling the country for more than five decades. But it is the Southern Cameroons crisis that is finally robbing the Yaounde government of its sleep. For more than two years, the Yaounde government has been ignoring calls for an inclusive dialogue as a major step towards addressing the political and military crisis that has put the country in the spotlight for all the wrong reasons. For three years now, the country’s two English-speaking regions have been the theater of a bloody conflict that has already consumed more than five thousand lives, including some 2,000 army soldiers. The number of those injured is in the thousands too and there is no end in sight. Government forces are the primary suspect of the violence that has made life unbearable in the two English-speaking regions of the country, as they have the nasty habit of shooting at any and everything, especially when some of their colleagues have fallen in combat. While the Yaounde government thinks it can ignore every call, the Americans have been figuring out how to bring the corrupt government in Yaounde to order. Americans just like their Canadian and British allies have kept urging the country’s president, Paul Biya, and his government to do the right thing for the sake of peace and stability in the Central African nation which, for many decades, was considered by many in the world as an oasis of peace in a desert of chaos. But the refusal of the ailing and senile Cameroon president to listen to the world has been upsetting many in the international community, especially the United States government which has been extending military and financial help to the cash-strapped dictator in Yaounde. The government’s refusal has prompted the US government to cut millions of dollars in security and military aid to Cameroon amid growing concerns over the Cameroonian government’s dismal human rights record. According to a US official who spoke to CNN, the US intends to “terminate” over USD17 million in security aid, including funds for radars, four defender-class patrol boats, nine armored vehicles, training programs for C-130 airplanes and helicopters and the withdrawal of an offer for Cameroon to be a candidate for the State Partnership Program. A planned US funded upgrade to a Cessna aircraft belonging to Cameroon’s elite Rapid Intervention Battalion has also been terminated. The battalion, which has been previously advised by US troops, has been accused of engaging in human rights abuses. Some of the security assistance money had been put on hold by Congress due to those concerns. The US government has continued to urge the Cameroonian government to take all credible allegations of gross violations of human rights seriously, investigate those allegations thoroughly, hold accountable the perpetrators of such abuses, and disclose the outcome of the investigations to the people of Cameroon, these calls have falling on deaf ears because the Yaounde dictators holds that only a military solution can bring peace to the troubled country. It should be stated that the Pentagon has already withdrawn an offer for Cameroon to participate in its State Partnership Program, a “security cooperation program” that teams US state National Guards with host nation militaries. Originally the Defense Department had intended Cameroon to partner with the Nebraska National Guard. The US has 14 such partnerships with African countries, including Cameroon’s neighbor Nigeria. The State Department is also seeking to have an additional USD 10 million that was placed on hold released to fund the sustainment of certain military equipment already in Cameroon’s possession such as Cessna airplanes, mud boats for patrolling Lake Chad, and Scan Eagle Drones. Gen. Thomas Waldhauser, the commander of US Africa Command, is scheduled to testify Thursday before the Senate Armed Services Committee. The Trump administration recently decided to cut the number of US troops in Africa engaged in counterterrorism with the bulk of those reductions expected to take place in West Africa. Meanwhile, another State Department officer who spoke on condition of anonymity to the Cameroon Concord News Group’s chairman over the phone said that with the events unfolding in Cameroon, it is clear that the Biya regime now belongs to the past. The government is anti-democracy. It is jailing and killing opponents who hold political views that are not in line with its own. “The US stands for democracy and we will not support a regime that is killing its own people. We grant millions in aid to the government and we support many programs in Yaounde to further democracy in Cameroon, but the government’s behavior in recent years has proven that it is not willing to be part of the democratic world and we think it clearly belong to the past. If Mr. Biya and his government do not take appropriate measures to be in line with 21st Century governance principles, the US and its allies will ensure that the government pays for the violations it has been accused of,” the official said. “If the reduction in military aid does not bite as planned, our administration will resort to other methods and this will include, but not limited to freezing the assets of senior government officials and refusing them and their children visas. We will be working with our allies to make sure Mr. Biya ends the violations taking place in Cameroon,” the official concluded. It is clear that these measures will hit the Yaounde government like a ton of bricks, especially as rights groups are working hard to ensure the country’s president acts in accordance with international human rights law. Amnesty International, a global human rights group, has already called on the US to press other donors to cut assistance to Cameroon. In response to reports that the US government has decided to cut security and military aid to Cameroon amid concerns over its human rights record, Adotei Akwei, deputy director for advocacy and government relations for Amnesty International USA said there was evidence Cameroon security forces had been involved in human rights violations. In June 2017, Amnesty International issued a report on torture in Cameron entitled Cameroon’s Secret Torture Chambers: Human Rights Violations and War Crimes in the Fight Against Boko Haram. In June 2018, the organization released a report detailing abuses in Cameroon’s Anglophone crisis, ‘A turn for the worse: Violence and human rights violations in Anglophone Cameroon’. The report was based on in-depth interviews with over 150 victims and eye-witnesses, and material evidence including satellite images.